This is a quick little knit that makes a great gift or stocking stuffer! 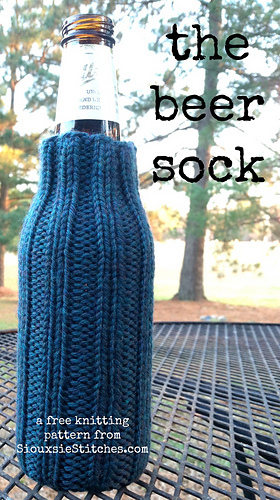 I created this design to give to my dad for his birthday, and he loves it because it doesn’t let ANY of the cold or condensation from the beer reach his hand (gotta love wool!). He swears it works better than any of his store-bought cozies! Stretches to fit most bottles and cans (simply fold down any excess fabric).